Yesterday, in one of my alt-personalities, I spent the day being an actor. While seldom a topic in my writing, this gig deserved a post. However, unlike my younger friends, it didn’t occur to me to snap any photos on my cell phone; 1. because I was playing a senior; and 2. because I am a senior. But truth is, I’ve rarely shot photos when I’m on a film shoot: there are cameras in so many directions, front, side, several movie cameras rolling and still shots shooting, it hardly seems necessary for more. The coolest thing, (besides being able to work as a professional actor, which I have been since 1979, professional in that’s when I joined the Screen Actors Guild although I’d been a nonprofessional since grade school), was I learned about a really cool program being developed in Kansas. My role was that of a rural Kansas woman with two morbidity diseases (meaning, I learned, two diseases that could lead to sudden death i.e. cancer, heart disease, diabetes, and lung disease) and who was some distance away from health care practitioners. She wasn’t Ma Kettle if that’s what you’re thinking. Rather, one of many people in Kansas, especially seniors, who often still live on their farms or in small towns with no hospital. Here’s the program, developed by KU Med Center on the Kansas side of Kansas City: it teaches rural people how to use a digital tablet to contact a health care practitioner for regular, live checkups, including checking their medications, a nurse-practitioner trained in remote care to listen to complaints, address concerns, give dietary and exercise information, and a way to get help immediately. The company setting up this program with KU Med even provides a portable receiver and trains the seniors how to use the remarkably simple tablet. The representative of the company told me they have also partnered with several smaller hospitals throughout Kansas. With all the who-ha about the Affordable Health Care debate, this is a valuable digital outreach. I’m probably somewhat biased because K.U. Med is our health care provider and I appreciate their Complementary Medicine department (I don’t take meds and rely on complementary medicine). Okay. Enough about them. Now about me :). As always, I had a great time. While I’ve worked on stage and did for many years, I much prefer working in film. There’s less drama. No one yells, you’re a team, everyone says thank you often, and voices are calm. I realize there are difficult film directors and crazy film actors, but I’ve not had that experience. The other cool thing about yesterday was I learned they chose me for this woman struggling with her health for another reason: they’d seen my reel on my agent’s site. A reel, for those who don’t know, is a short film with clips from several of an actor’s projects. So, since this is an intro to a piece of my life you probably know little about, here’s a link to my most recent reel on Talent Unlimited, my acting agency for years. 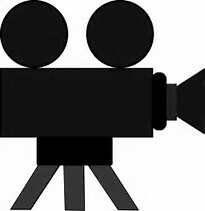 When you click on that link, you’ll arrive at my home page; in the middle of the page, there’s a link that says DEMO REELS. Click on that. There’s four scenes from four different projects. You’ll notice I play old women often… or rather, always. One of my most favorite ever roles is the last one on this clip. Still makes me laugh. And I’m still working. I will be the Judy Dench nobody’s ever heard of. Except you. And at the end of the day, like all working seniors, I was plumb tuckered out. Nothing smells clean. Outside my window, the willow struggles into a fragile green sheen; the redbud is millimetering into tiny sharp arrow tips. In the storms racing through Missouri this week, we missed being in a tornado, tornadoes being lazy creatures, all in all, in spite of their fierceness, and don’t like battling through a city for the most part. Their preference is for flat land. We did get a half inch of rain, which brings our grand total of moisture since the beginning of the year to about an inch and a half. We’ve had one mild snowfall. Last evening, I cleaned the back porch, screened on two sides, buttressed into the house on two sides. We carried out the leftover firewood and stacked it back outside. I began sweeping up shovelfuls of dust and dry leaves, nose twitching at the reminder of drought creeping in from the west. Everything has a powdery coat. I feel like one of the women Gordon Parks photographed during the dust bowl days: hand shading eyes, watching for locust or a rolling dust storm. But I’m probably being over-dramatic. It’s not quite that dry although dry enough. When I lived in Hawaii at Kalani Honua down by Volcano, my job, in exchange for free room and board, was garden work (once the memoir is published, you can read all about it). In the nights, rain often pocked through the jungle and across the compound. I’d wake briefly, glance out the screened window beside my bed, think I won’t have to water the garden, and fall asleep in the soft green scent of jungle, leaves rejoicing, earth wafting its gratitude. I wondered, from time to time, how you’d explain the smell of dirt to someone who hadn’t stuck their hands in it: loamy, yes, but that presupposes knowing what loam smells like. There is a word to explain the smell of rain, petrichor, a combination of bacterial spores and plant oils, but about as useful in terms of scent as describing loam. We have city water and hoses. I water the yard, taking care to soak the ground close to the house so the old rock basement doesn’t shift and crack walls. You’d think a house this old, built in 1924, with a rock basement, would have gone through all the shifting it was going to do in its close to hundred years. You’d think. I thought the same thing a few years ago when we had a summer drought. The ceiling in a dining room corner dropped nearly two inches and the stairway wall cracked. We found a company who restores old houses. They restored. Hence, a pricey lesson in old home management. I learned to no longer think that way. I water the house. Inauguration Day. It makes me sad. Not sobbing sad but melancholy for a First Family that felt like mine. Like one of my kids has lost a job he was good at. And while I know there will be another job, this is, after all, a resourceful and diligent child, I won’t see him as often. Yes, I know you know I’m white and you may think I’m being melodramatic. Perhaps I am. Here’s the thing: I grew up in a family of six white Kansas farm kids with a Quaker mom who wrote stories, a hard-working step-dad who told stories, and his dad, Grandpa Albert, whose stories were of “trading with the Indians” and scary stories from his Bohemian immigrant father. We always had books in our home. The farm, an 1800s land grant farm, is still in the family. By the time I was five-years-old, we’d lived in five different places. Unfortunately, heart disease wandered with the Sunderland family and my father died young, hence the step-father. But my siblings and I took up the heritage and kept traveling. Our children, raised by this eclectic and wandering group of siblings, married a world: one Korean, one Filipino, one African-American, and two Hispanics, and a bunch of various background white folk. Barack Obama is two years older than my oldest son who now also has gray hair and a gray beard. What gives me hope is that there’s more of us multiple-race families who love each other; more of us who welcome strangers and make them family; more of us who care deeply for the country and our family. I’m proud to say all of us were Obama supporters. I hope Barack Obama has a good break. Sits and stares out the window. Sleeps late. That’s what I’d wish for any of my kids/nieces/nephews after a long stretch of work. But I’ll miss him and his elegant wife. Afraid isn’t one of the things I do much. It’s an over-used word that means nothing. I’m afraid it’s going to rain; I’m afraid the mail hasn’t come yet; I’m afraid it’s windy today; I’m afraid they were out of mayonnaise at the grocery store. reasoned; get involved with doing instead of fearing. I’ll join the women’s march tomorrow but avoid the sections where yelling and anger are going on. It’s not my first march. There’s a trail of them behind me. I will walk for my mother who remembered when women were “given” the right to vote; I’ll walk for my mother-in-law who never took authority, church or any other kind, seriously; I’ll walk for my friend Willy’s mother who was, eight years ago, denied communion because she wore a Hillary Clinton button to church one day. My first women’s march was in 1972, so it’s about time for another. I will support the younger ones, women and men, who are determined to change the world. But I won’t watch as the Obamas take off in the helicopter or however they are leaving. They’re not going anywhere. 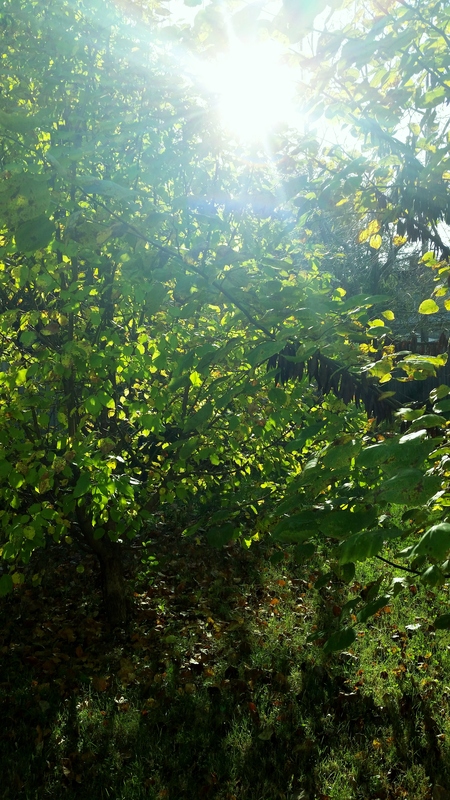 The light drew me outside, after a nap, after a chaotic few weeks of new baby birthing and old elders dying, after a snap of cold days and frost that had me back into long sleeves and fleece vest, after looking at my writing space and seeing only chaos, the light called. Smoky and golden, as only light can be during Indian Summer. Along with the light, it’s the shadows that capture me, deep and mysterious. As the Farmer’s Almanac says, Indian Summer comes after the first frost, and while we’d had spurts of late fall warm days in previous years, the frost hadn’t proceeded them and that frost somehow or for some reason, changes the light. The shadows deeper, everything a little fuzzy. 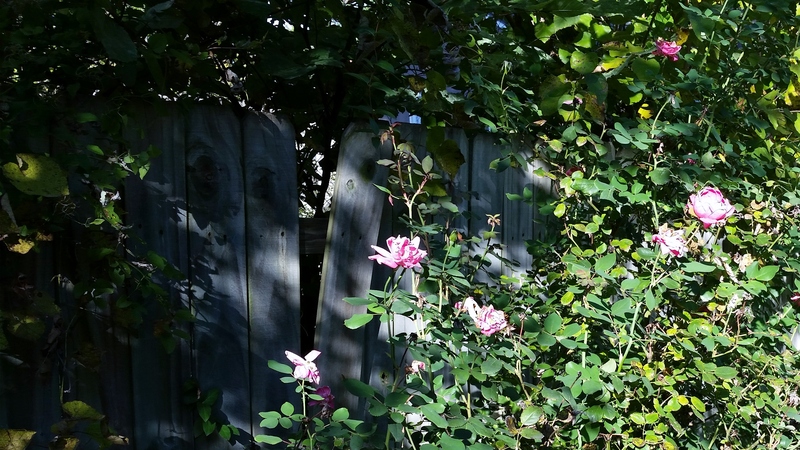 Roses bloomed on the back fence. Everything needs cleaning before winter really hits. The fence mended, the gardens cleared out and mulched, the volunteer trees here and there that have sprouted in random spots, the strawberries mulched, and the spent tomato vines pulled up and put into recycling. The list is daunting. “A moving, cool, shallow polar air mass is converting into a deep, warm, stagnant anticyclone (high pressure) system, which has the effect of causing the haze and large swing in temperature,” so says the Farmer’s Almanac. I don’t really know what any of that means, what I know is the shadows and the colors are mysterious. One year, maybe my freshman year in high school because I’d just stepped off the bus to walk up the lane, I saw a brilliant spread of red leaves, stopped and picked a bunch, and continued to walk up to the house carrying my bouquet under my chin, and presented them to my mother. “That’s poison oak!” my mother shouted, grabbing up a paper bag in which to deposit my treasure. My head swelled up like a pumpkin. I missed several days of school. And I learned to admire the beautiful leaves from afar. We have no poison oak or even ivy in our yard, just summer detritus. I am, as of yet, admiring it from afar too. They may need to amend their saying now that climate change is upon us. Everything weather is a little wonky these days. I guess you could say that for people too. God willing, no one will jump from our bushes.